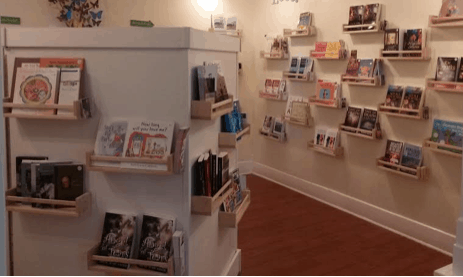 When Patti Brassard Jefferson opened Gulf Coast Books in April of this year, it occupied a space that more closely resembled a cubby than a retail store, and it only had room for a few dozen indie authors. Five months have passed since then, and everything has changed. Children’s author and illustrator Patti Brassard Jefferson has announced that next month she plans to open a new larger bookstore called PJ Boox. The new store will fill a 1,700 square foot store front in Fort Myer's, Florida, and carry ten times as many books as its predecessor, Gulf Coast Books. PJ Boox will be many multiple's the size of its predecessor, and it will also be about six times the size of Local Editions, another indie-focused bookstore which launched in Colorado last month. The store will operate on a consignment model, with each shelf rented to authors. Edit: This is similar to the coop fees publishers pay chain bookstores for placement, only on a smaller scale. As at Gulf Coast Books, authors will be paid monthly and get 100% of net revenues (minus credit card fees) for books sold in store. They will also receive 80% of revenues for books sold through the store's website. Brassard is also planning to maintain an active events schedule with in-person author events as well as virtual visits via Skype. There's space to comfortably seat 20 people for readings and book clubs, and PW reports that the mall can accommodate larger crowds. PJ Boox is the third domino in a chain that will only get longer and wider as time goes by. As I pointed out last month when I wrote about Colorado Springs-based Local Editions, indie authors are responding to being shut out of bookstores by routing around the problem. They're launching their own stores so they can sell to the public. Absolutely. Only the beginning. It’s an extremely viable business model, having self-published authors pay for monthly shelf space. (Which was what the big traditional publishers basically did in the old model.) You could build a national chain based on this. Great point! This is a lot like the coop fees the major publishers pay. I’ll add that to the post.